Andlau, for a visit or a weekend in the Alsace region in every season! Andlau, is a village filled with history in the heart of the Alsace region. There are a thousand and one riches to be discovered in Andlau. The floral village was developed around a powerful abbey founded in 880 by the Empress Saint Richarde. The abbey’s church, constructed on the abbey’s sanctuary, presents the most carved gateway into the Roman times in Europe, an exceptional historic approach, as well as a crypt from the XIth century. As all places loaded with history, Andlau has its legends. Let the Zinck family tell you about the legend of the Andlau bear, (l’Ourse d’Andlau), or that of the phallic stone. Andlau is situated on the pilgrimage route of Saint Jacques de Compostelle in Alsace and on the GR5 route. Ramblers, we would be delighted to welcome you to the Zinck Hotel for a good meal, well-deserved! The Alsace is a region that is good to visit in any season! At the start of the winter, the Alsace is the ideal destination to get into the Christmas spirit. The Christmas markets of the Alsace are now famous worldwide. 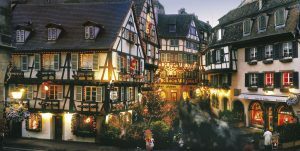 Staying at the Zinck hotel at Andlau for the Christmas market allows you to benefit from a central location: Strasbourg and Colmar are accessible in thirty minutes, the traditional Christmas markets of Kaysersberg, Ribeauvillé, or Riquewhir are also accessible in thirty minutes, without having to suffer from the crowds. In winter, you can also practice cross-country skiing in the little resort of Hohwald, situated around twelve minutes from Andlau, or ski on slopes and practice the luge at Champ du feu, a ski resort situated around twenty minutes from Andlau. Spring and summertime are favorable to long walks in the vineyards, along the canals, or in the forests, searching for the remains of fortified castles that testify to the medieval past of the region. It is also the season of the wine festivals. Each village celebrates in its own manner the precious nectar. In the autumn, nature adorns itself in a thousand golden glows to create breath taking landscapes. You can participate in numerous wine harvesting celebrations in the villages of the wine route and even take part if your heart so desires! Andlau, key site for the great vintages of the Alsace. Andlau is a rich region, the village indeed accommodates 3 great vintages: the Kastelberg, the Moenchberg, and the Wiebelsberg. The hillsides, exposed to the east and the south, are a succession of microclimates favorable to the great wines of the Alsace. Sylvaner, Pinot blanc, Riesling, Muscat, Pinot gris, Gewurztraminer, and Pinot noir find here predilecting soils. The Andlavian winemakers take pleasure in sharing with you the fine nectars throughout a commented wine tasting. You will discover the cellars and the vines of which none resembles its neighbor, each serving to illustrate the picturesque diversity, and the richness of the Alsacian vineyard. Staying at the Zinck hotel in Andlau allows you to quickly reach all the unmissable attractions of a visit or a weekend in the Alsace region! 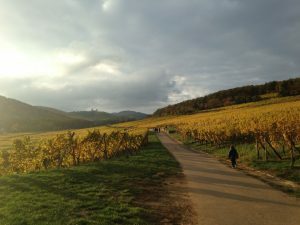 Here are some ideas for outings to discover the Alsace region as you so please! The Zinck hotel, is it not the ideal place from which to discover the Alsace region? Reserve your bedroom! Stroll on foot or by bicycle in the Alsacian vineyards or in the discovery of castles. Routes of all levels start from the hotel, do not hesitate to request details from us. To prepare your visit to the Alsace region, do not hesitate to contact us, the Zinck family will be pleased to share with you their favorites places and the best addresses!